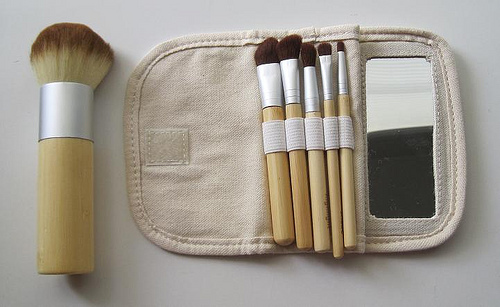 Then there are the essentials that come with applying makeup: makeup brushes. And so today, the Clog is going to bring you a very useful and budget-friendly tip for the caring of your brushes. So big news: Brushes get dirty. Hardened gel and cream eyeliner, days-worth of liquid foundation, congealed concealer, and old face powder all caked onto your beauty tools. And unless you’re cleaning them, those things stay on your brushes and every day, you’re putting new makeup and all that crap on again . Imagine all the bacteria and grossness being put on your face: oil and sebum from yesterday, eye boogers, and who knows what else. Therefore, it is important to wash them. Water alone doesn’t cut it and it’s easy to damage the brushes if you don’t treat them properly. Yes, there are makeup brush cleaners. Fabulous but expensive in the long run. So here’s the magic formula that we have heard about: olive oil and dish-washing soap. We’re serious. It’s so easy to do this. Not even kidding. * Go to any store with olive oil. Shouldn’t matter whether it’s cold pressed or not, but try getting extra virgin. * Have dish-washing soap at hand. * Simply pour a bit of the olive oil onto a thickly folded paper towel square and then squeeze/pump the soap into the olive oil. The amount depends on the size of your brush tips and how many you want to clean. * Start swirling the dirty brush tips into the mixture. * Occasionally wipe the frothy mix off your brush onto another paper towel or a clean part of the one you’re using. You’ll very soon start seeing the original color of your brush. Keep doing this for all your brushes. The mixture on your paper towel will get black and dirty; you have been warned. * Rinse gently and well under running water. Set the brushes aside on a new piece of paper towel so that it soaks up the water and your brushes dry out. That’s it. It’s like you just shampooed and conditioned your brushes in the same way you do to your hair. Give them some time to dry and they should be like brand-new. We won’t be surprised if you end up just running your finger over your brush tip, amazed with its softness while thinking, “My brush tip color is brown? I swear it was black all these weeks…” (there’s a sign you need to clean them more often). The Clog would love to get any sort of feedback on whether you’d like more little tips like this. If so, we can’t promise we will teach you guys a legitimate way to powder on some “fake abs” for summer, but we’ll try our best. And if not, at least we hope this was helpful. Above all, you women are beautiful no matter what. Not going to preach now, but don’t let makeup be something you hide behind. 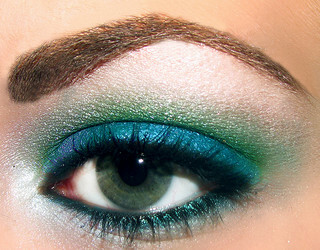 Let it be something that highlights the things you like about yourself, such as your eye color or your skin tone. Just because it’s spring break, it doesn’t mean you need a Jersey Shore-esque tan. Have fun, ladies! I like what you guys are doing. Such clever work and reporting! Carry on with the superb works guys. I have incorporated you guys to my blogroll. I think it will improve the value of my website. Thank you, I’ve recently been looking for information about this subject for ages and yours is the best I’ve discovered so far. But, what about the bottom line? Are you sure about the source?|What i do not understood is actually how you are no longer actually a lot more neatly-liked than you may be now. You are so intelligent. Hey very cool website!! Man .. Excellent .. Amazing .. I’ll bookmark your blog and take the feeds also…I am happy to find a lot of useful info here in the post, we need work out more strategies in this regard, thanks for sharing. . . . . .